Dr. Sylvia Earle, revered marine biologist and conservationist, will give a state of the seas address. The event will include a viewing of the new giant-screen film Secret Ocean 3D that features a narration by Dr. Earle and amazing imagery captured by director Jean-Michel Cousteau and his team. Armored warriors of the past inspired the creative genius of a filmmaker-in a galaxy not so far away. In this multimedia tour of the Samurai: The Way of the Warrior exhibit–led by HMNS staff and a few guest Jedi, Sith and samurai guides–the origins of many of George Lucas’ Star Wars heroes and villains will be unveiled. You will also enjoy demonstrations of light saber and kendo katana. The compelling links between Samurai and Jedi will build your appreciation for both. Challenge your brain and develop your S-IQ (Science IQ) with hands-on experiments, demonstrations and observation. It’s the all-new Weird Science Event! Peek behind the curtain for an exclusive look at how “cool” science works in a museum. Mix, stir and mash compounds around the T-rex pit and make all kinds of goopy fun. Help feed the fish and other critters, plus learn how to care for them. Or you can try going arboreal and hang out in a tree in the TreeHouses exhibit. It’s our biggest science night of the year with something for everyone! The social set has never looked so smart! 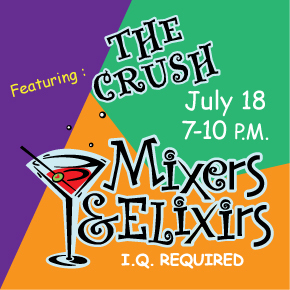 Mixers & Elixirs is back and it’s better than ever! We’re celebrating the year’s geekiest holidays with a cool twist, so pop on over to our place to mingle, clink your cocktail glass, and break out your best dance moves. Doors open at 7 p.m. for the live band, dancing, cash bars, and the city’s best food trucks. The perfect party, where the science club meets the social set, happens each month from June through August. Hitting this scene is a sure sign of intelligence!